November is a special month in the Catholic Church to remember those who have died. Abbé Damas Kpamou from Guinea, remembers his family members who died in the 2014-2015 ebola epidemic and how Caritas helped those who survived. 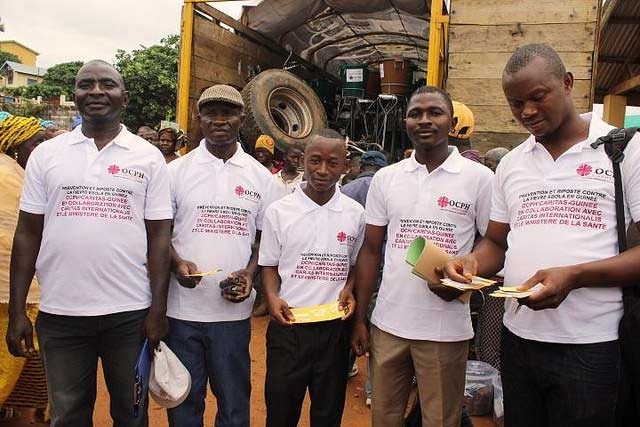 Caritas is distributing hygiene materials and teaching people about Ebola prevention. Photo: OCPH/Caritas Guinea. I’m a priest in Nzérékoré in Guinea. I was ordained two years ago in 2014. But my ordination risked not taking place because members of my family got ill with ebola. When my family got ill, I took the necessary measures to protect myself. I had to keep a distance from family members who were sick. I had to strictly follow all of the hygiene prevention measures put in place by the World Health Organization. We were told to keep calm and not to panic about this disease which was ravaging our families and communities in Guinea and other West African countries. I made sure I did awareness raising among family members who weren’t sick, so they wouldn’t fall ill.
Caritas at both a local and national level didn’t spare any efforts in coming to our aid. As the diocesan Caritas was already there, working in the community, they were able to work a lot on awareness raising as people were familiar with them and trusted them. They coupled this with the distribution of soap, bleach and buckets so people could disinfect their hands and limit the spread of the disease. They took care to make sure the families of victims were supported. They gave us rice, oil, sugar, milk and salt so they could eat. They also provided medicines and clothes. They made sure children stayed in school by giving out school uniforms and materials such as books and pens to families who had lost income as a result of being affected by ebola. The first cases of ebola appeared in Guinea in March 2014. Liberia, Sierra Leone and Nigeria subsequently reported cases. Over 28,600 cases were reported in these countries. Over 11,300 people died. Among the many actions Caritas took, it worked to ensure those who died were buried safely and with dignity. The end of the ebola virus was declared in Guinea in June 2016. It was really hard seeing twelve members of my family falling ill with ebola and only five surviving. The disease left behind a lot of widows, widowers and orphans. Even though our country is now ebola-free, the after-effects still weigh heavily on the survivors – emotionally, socially and economically. I found Caritas’ support very consoling because they didn’t just give us aid, they also comforted us and walked with us through that terrible time. Their help made me even more aware of the importance of the mission of charity of the Church. The challenges left in communities hit by ebola are enormous. We have to find the means to support the survivors and the orphans. Those who haven’t been able to work need support in finding ways to keep themselves economically. Communities need to ensure schools have toilets and access to wells where they can find safe drinking water. They need income-generating activities to be created so people can support themselves. Caritas continues to work on hygiene awareness raising in my community, but they need funds to continue helping us in other ways. One of the most important things for me now is to make sure I pray for the dead, particularly in the month of November. I pray especially for those who died from ebola, that they find themselves blessed by the grace of God.